Select the check boxes associated with the required profiles. 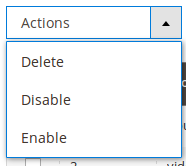 In the Actions list, select the Enable option to enable the selected profiles or select the Disable option to disable the selected profiles. The selected profiles are enabled or disabled based on the selected option.